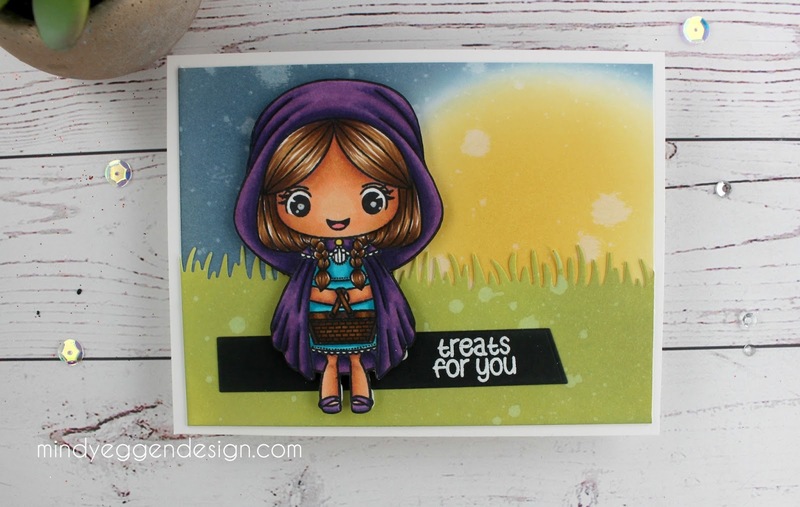 Nicole – Treats for You! I sat down last night to play around and sometimes a project takes takes control and you don’t realize what you created until its done. That is what happened with this card. I actually started by creating the background first. I used a piece of Bristol Smooth cardstock cut to 4″ x 5 1/4″ and on one side started in with Fossilized Amber Distress Oxide. I just went in a small circular motion to create a circle. The middle is darker and I made sure to be light on the edges. Next, I came in with some Broken China Distress Oxide just to put a layer down. I did this all around the moon I just created and blended right up to it but being careful not to mix my colors. Then I went over the top of that with some Faded Denim and Black Soot. I spritzed water and dabbed up with a paper towel. For the grass, I ink blended Twisted Citron and Peeled Paint and spritzed water on this as well. I then die cut this piece using a Grass die from My Favorite Things so I could add this to my background. My image is from Stamp Anniething Stamps. She is Nicole and is part of their latest release. Yes typically you could color her red but I wanted to get out of the box a little and did purple. I also love coloring purple because I can get some really good depth with the dark colors. She is stamped onto Neenah white cardstock with Memento Tuxedo Black Ink and colored with copic markers. Once colored, I cut her out with my Scan n Cut machine. I added the white to her eyes with a white signo pen. The sentiment is also from the Nicole stamp set and I just stamped it onto black cardstock with wow embossing ink and heat embossed with Gina K Designs White embossing powder. I attached the sentiment to the card and added Nicole on top with some foam squares. This whole piece is added to a white A2 size cardbase. You can pick up Nicole stamp set HERE.